This is a great deli/picnic/potluck recipe because it goes like this: saute peppers and onion, boil pasta and dump a few other things in a bowl. Garnish and serve. You’re a kitchen rock star (Bam! Lights on you, loud music, heads turn, soft wind through your hair.) Since many of the ingredients will be from a jar (i.e. artichoke hearts), read how many ounces are in the whole thing and do the math from there. No need to stress about specifics, just do the best you can. 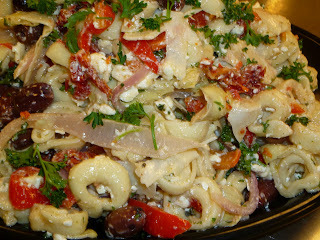 Also, the olives and feta are quite salty, so go real easy on the salt before tasting the finished product. 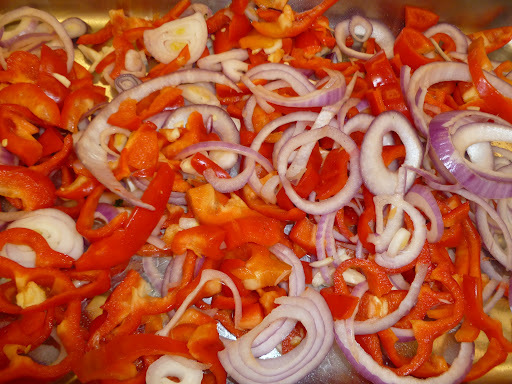 1) Roast pepper/onion/garlic mixture. Set in a large mixing bowl. 2) Cook pasta until al dente then add to cooked peppers with 1-2 tablespoon of the pasta water. 3) Add dressing ingredients into a jar and shake to combine. Dress salad with vinaigrette and garnish with parsley. Serve warm or chilled.